Indium Corporation's Dr. Ron Lasky, Senior Technologist, delivers an informative overview of the history of, and insight into the future use of, indium metal in a video available at www.indium.com/blog/phil-zarrow. As part of the Electronics Assembly with Phil Zarrow series, this video features Lasky and SMT expert Phil Zarrow, President and Principal Consultant for ITM Consulting, discussing historical and unique indium and indium alloy applications. 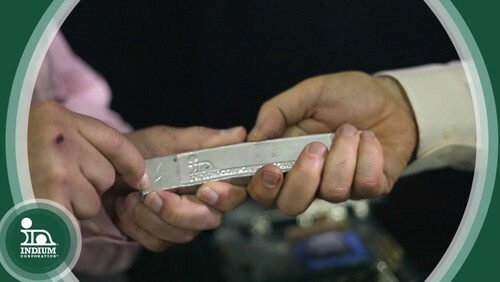 For more information on indium, high-purity indium, and indium alloys, visit www.indium.com/metals/indium. Dr. Lasky, holder of the prestigious SMTA Founder’s Award, is a world-renowned process expert and a Senior Technologist at Indium Corporation. He is also a Professor of Engineering and the Director of the Cook Engineering Design Center at Dartmouth College. He has more than 30 years of experience in electronics and optoelectronic packaging and assembly. Dr. Lasky has authored six books, and contributed to nine more on science, electronics, and optoelectronics. Additionally, he has served as an adjunct professor at several colleges, teaching more than 20 different courses on topics ranging from electronics packaging, materials science, physics, mechanical engineering and science, and religion. Dr. Lasky holds numerous patent disclosures and is the developer of several SMT processing software products relating to cost estimating, line balancing, and process optimization. He is the co-creator of engineering certification exams that set standards in the electronics assembly industry, worldwide. Dr. Lasky also authors a technology blog, which can be found at www.indium.com/drlasky.